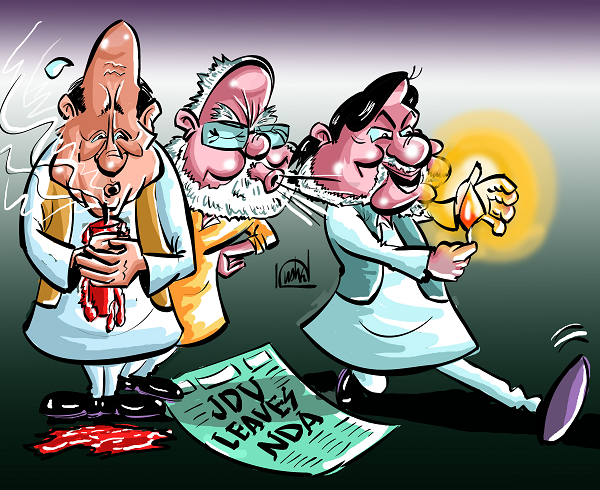 Nitish kumar as Chief minister of Bihar has hit himself by under estimating the popularity of Narender Modi. Modi is popular because of his good governance, his personal & National Character as well his honesty and sensitive human nature. He has all those qualities which most of the politicians do not has beside all that he also is a strong man of words. these are the some of the reasons for which a common Indian wants Modi to be a PM. Because of the goodness of Modi the BJP is going to be in big advantage in the coming elections and Nitish will badly hurt himself when he will be without BJP, because it was not the Janta Dal U for which the people voted for it was certainly the want of BJP in the public of Bihar. this all will be evident in coming elections.